We demand from the Bundestag and the coming government: Germany should no longer perform as the disciplinarian of Europe, taking Greek water into private ownership must be stopped ! 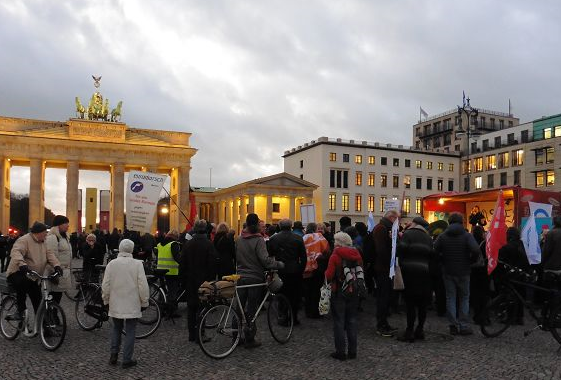 This was the demand on November 13th 2017 in front of the Brandenburg Gate. The petition was addressed to the EU and the (former) minister of finance, Wolfgang Schäuble. Schäuble (at the time still minister of finance) refused to accept the signatures personally. Therefore we asked members of the Bundestag to hand them over the signatures. 202.000 signatures were handed over to M.P. Sevim Dagdelen who promised to transmit the message to the Bundestag. Meanwhile more than 205.000 people signed the petition. Furthermore the comedian Gerald Wolf contributed with two songs about Schäuble and about Greece. At last Christa Hecht, in charge of AöW, the alliance of public institutions and public operators of water supply and wastewater disposal, held an engaged speech against water privatization in Greece and for solidarity with resitance against it. About 100 people with flags and banners of unions and NGOs took part in the handing over of the signatures.